A picture that you wanted to be an illustration taking up a whole page by itself and wonky on it too! Ever since I first started using Word, I’ve been finding ways of getting pictures and text to sit together exactly the way I want them to: first as a teacher making worksheets then doing layout for community magazines. But before you can begin to think about getting an image into the right place on a page, you need to make it roughly the right size so you can see how the text will fit around it — and that’s what this post is all about. 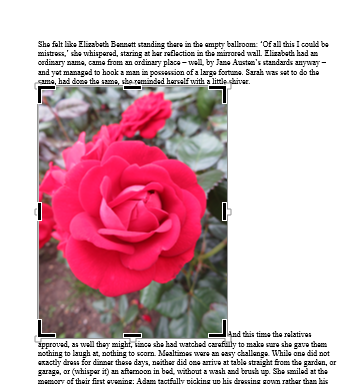 I’m working in Word 2013, which has significant improvements to picture handling, but I have included what to do in Word 2010 where this is different (the same instructions are good for Word 2007). If you are using an earlier version of Word then some of the things now on the ribbon were on the picture toolbar and most of the methods that go through a right-click menu will also work, although the exact appearance of some of the menus will vary. How do I make the picture fit the space I have available? There are two things you can do to make a picture take up less space on the page and it is important to be aware of the differences between them. When you resize a picture, you basically squash it so it looks the same but fits in a smaller space. When you crop a picture you are effectively trimming some off, part of it disappears from view. In the case of the picture above, we’re not even seeing all of it. Can you see little white boxes in the middle of two of the edges and at one of the corners? These are called handles, and we’ll be using them in a moment to re-size the picture. For now, though, the ones on the bottom and on the right-hand side don’t show because they, and some of the picture, are off the edge of the page. How do I resize a picture? The easiest way is to hover over a handle at one corner of the picture. A double-headed diagonal arrow appears. When you let go, your new, smaller picture is in place. In ribbon versions of Word, when you click on a picture a new ribbon appears and, right at the end of it is a group called Size. The two boxes on the right show you the height and width of the image. You can change these using the little arrows. Notice that, as you change one the other changes automatically (although the change may not show until you stop using the arrows). If you want to make a big change it can take a while to scroll through a millimetre at a time. Instead, you can click in one of the boxes to highlight the measurement, type in your new value (no need to type ‘cm’ or ‘ cm’, Word knows you’re working in the same unit) and press Enter. The other will magically change to match and your picture will appear at its new size. 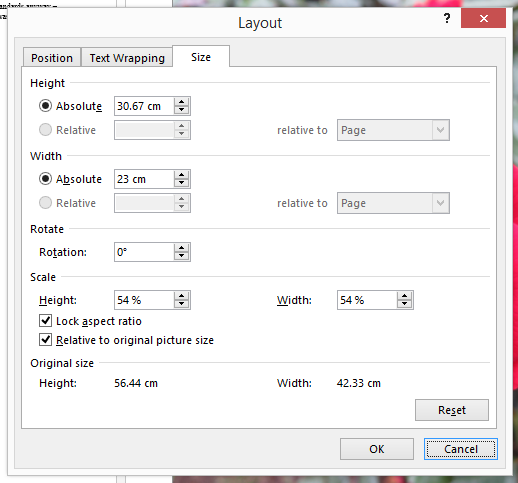 Just as on the ribbon controls, you can scroll through alternative sizes or type in new values for height and width. You also have the option of making the lengths a certain percentage of the original values. Make sure that Lock Aspect Ratio stays ticked so that the height and width keep changing together. When you do this, thick black crop marks appear at the corners and edges of the picture. As with using handles for resizing, simply click on these and drag them inwards. The bit of the picture that will remain stays bright and the bits that are going to be lost go grey. When you are happy with what you have, simply click somewhere else in the document and only the cropped bit will remain. 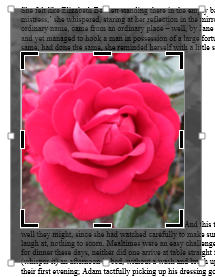 You can also crop pictures by using the right click menu to go to Format Picture and choosing options from there, but it involves typing in where you want to crop from, and how much, using numbers. Again, depending on the size of the picture and the amount of working memory your computer has available, you may be able to see what’s happening to the picture as you change the figures, but it’s still not as straightforward as using the crop marks. How do I make pictures go where I want them? So now the picture is a reasonable size to fit on one page with the words, but the page doesn’t look very good. The picture is stuck randomly in the middle of the text and there’s a huge white space. 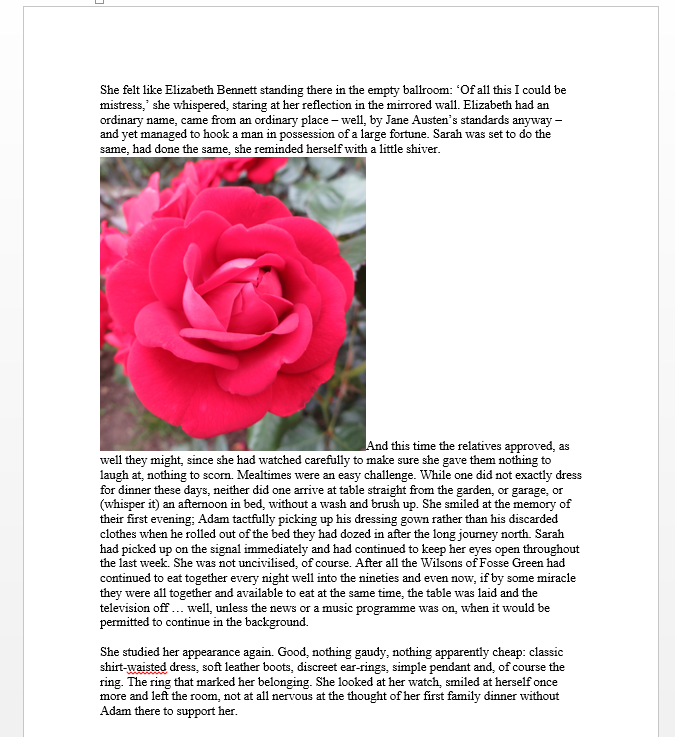 I’ve written a post about one way of making the picture nestle in amongst the words over on Liz Dexter’s LibroEditing blog, and next week I’ll show you a way of dealing with a lot of pictures in a single document. This entry was posted in Technical and tagged images, Microsoft Word, objects, pictures, Word 2013. Bookmark the permalink.